Premium quality traditional Aran sweaters in 100% Irish wool featuring flecked yarn design. 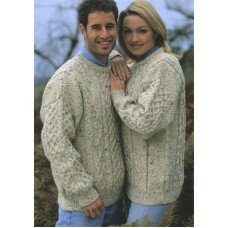 Aran sweaters from the west of Ireland are the classic fisherman's woollen sweaters. Traditionally handknitted using a chunky and highly decorative cableknit design, these Aran sweaters are warm, long-lasting and suitable for a wide variety of occasions. Perfect with jeans as comfortable and cosy casual wear, Aran sweaters can also be worn with trousers or suits for more formal wear - ideal for expressing your Celtic roots! Children's sizes of these Aran sweaters with flecked yarn are available from Achill Knitwear in the children's Irish sweaters section. These stylish Aran sweaters feature a flecked yarn and are only available in the natural nep (shown in image). Sizes available for this flecked yarn Aran sweater are: small, medium, large, X-large. See our Size Chart for international size comparisons.